Leader of Opposition in the Assembly Paresh Dhanani announced this after a Congress delegation, comprising 25 MLAs and other senior leaders, met Chief Minister Vijay Rupani and handed him a memorandum raising a range of issues, including the demands raised by Hardik Patel. 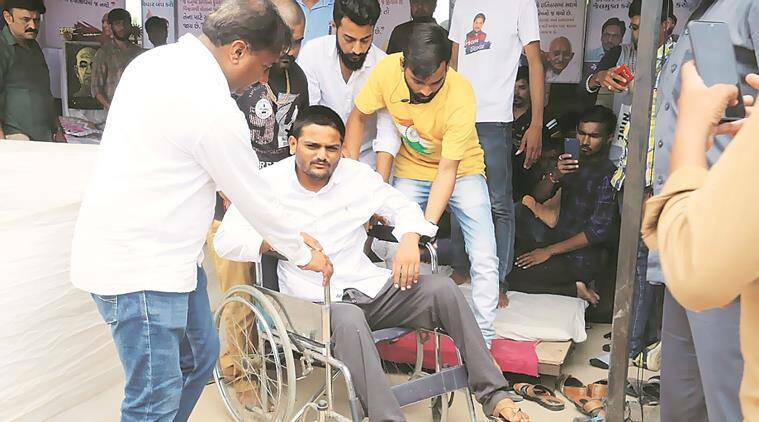 The Congress on Thursday announced to observe a 24-hour-fast across the state on Friday in solidarity with Patidar quota leader Hardik Patel who has been sitting on an indefinite fast since August 25 for farm loan waiver and reservation to Patidar youths in government jobs and education. Leader of Opposition in the Assembly Paresh Dhanani announced this after a Congress delegation, comprising 25 MLAs and other senior leaders, met Chief Minister Vijay Rupani and handed him a memorandum raising a range of issues, including the demands raised by Hardik. The Congress delegation demanded that the state government should begin negotiations with Hardik and accept his demands concerning farm loan waiver. “If the state government does not give a positive response to our demand, the Congress will sit on a 24-hour fast at each district headquarters of the state from 11 tomorrow in support of Hardik… The government should immediately start talks with Hardik and sort out the issues raised by him,” Dhanani said after meeting the CM. While the BJP government has asked Hardik to call off his fast, it has not cleared its stand on talking to the Patidar leader over his demands. Reacting to the Congress leaders’ meeting with the chief minister, Revenue Minister Kaushik Patel said the government had not received any official representation from the PAAS to hold talks with Hardik. “A few days ago, we had appealed to the Patidar leaders, who came to meet us over this issue, to convince Hardik to end his fast. The government is also worried about Hardik. However, they (PAAS and Hardik) did not listen to the senior community leaders,” the minister told reporters. He was referring to Tuesday’s meeting of ministers with representatives of six Patidar socio-religious outfits. The BJP also slammed the Congress, saying that submitting the memorandum to the CM, the Opposition was making efforts to sustain its political existence in the state. “The Congress, which has been struggling to sustain its political existence, is now making futile attempts to misguide the society by submitting such a memorandum. I want to ask a straight question… Will Congress declare that they will give reservation to the Patidars under OBC quota? And will the agitators also clarify if the Congress has given them any formula or assurance of providing OBC reservation?” said state BJP chief Jitu Vaghani. Accusing the Congress and Hardik’s outfit — Patidar Anamat Andolan Samiti (PAAS) — of “blackmailing” the government to gain political mileage through the fast, Vaghani said, “In democracy, everyone has a right to do andolan (agitation) to put forth their demands. But even Mahatma Gandhiji did not say that one should do zabarjasti to get one’s demands fulfiled. The government has to take care of every community’s interest. If the demands are within the framework of Constitution, the government can think over it. But it is not reasonable to do emotional blackmailing only to attain political mileage,” Vaghani added. 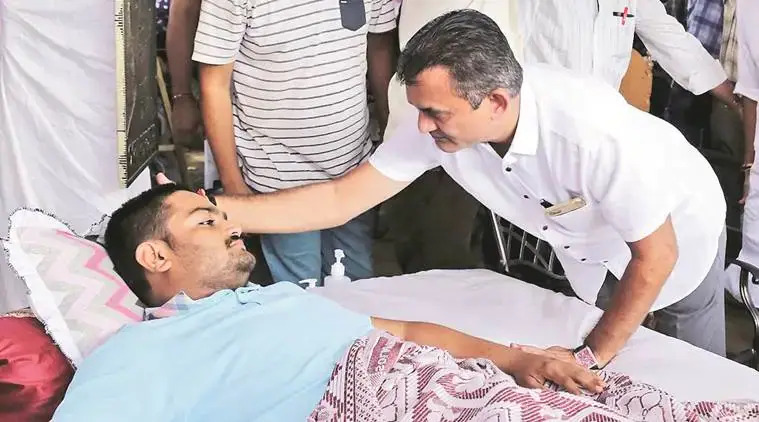 Hardik Patel, whose indefinite hunger strike entered thirteenth day on Thursday, gave up taking water and expressed his disappointment with the BJP government which has not yet responded to his demands. Convener of Patidar Anamat Andolan Samiti (PAAS) Nikhil Savani said, “From today evening, he (Hardik) has stopped taking water since the state government has not been talking anything about our demands.” According to PAAS conveners present at the fast venue, Hardik has lost significant weight resulting in so much weakness that he has started moving in a wheelchair.